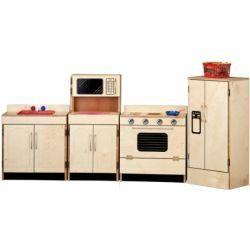 Beautiful Baltic birch set that has a stove, Sink, Cupboard, and Refrigerator. Made of 3/4" plywood, this kitchen contains a sink, oven and hutch all-in-one for those with limited space. Comes with knobs, burners, taps, sink, cup-hooks and four casters. Cupboard: Store and display dishes in this cupboard that has plenty of room for pots and pans too. Has nicely rounded and smooth beveled doors. Stove: Beautiful Baltic birch stove has silk-screened burners and oven window that won't rub or peel off to look like the real thing. Knobs turn with high/low settings. Oven door has a nice long handle to hang your towel. Open oven door and reveal a removable shelf. Sink: Matching sink has simulated cold and hot water taps and a removable sink pan. Has nicely rounded and safe beveled doors. Looks just like mom's modern kitchen. Inside is a shelf for pots and pans and pretend dish soaps and cleaning supplies. Refridgerator - Made of a 3/4" beautiful baltic birch this refrigerator is a modern side by side, with a silk screened ice maker on the freezer door that won't rub off.